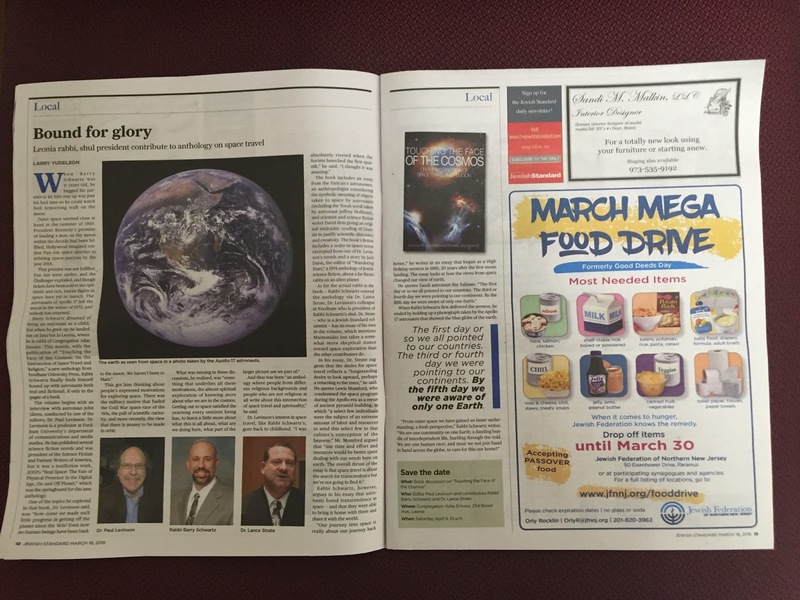 The March 18th issue of the Jewish Standard carried a feature article of no small interest to us here at Congregation Adas Emuno. The piece, written by reporter Larry Yudelson, is entitled Bound for Glory (and yes, click on the title to read it over on the Standard's Times of Israel hosted website), with the following subtitle: "Leonia rabbi, shul president contribute to anthology on space travel" (and can you guess the name of that Leonia shul?). When Barry Schwartz was 11 years old, he begged his parents to let him stay up way past his bed time so he could watch Neil Armstrong walk on the moon. Outer space seemed close at hand in the summer of 1969. President Kennedy’s promise of landing a man on the moon within the decade had been fulfilled. Hollywood imagined routine Pan Am space shuttles to orbiting space stations by the year 2001. That promise was not fulfilled. Pan Am went under, and the Challenger exploded, and though tickets have been sold to the optimistic and rich, tourist flights to space have yet to launch. The astronauts of Apollo 17 left the moon in the winter of 1972, and nobody has returned. 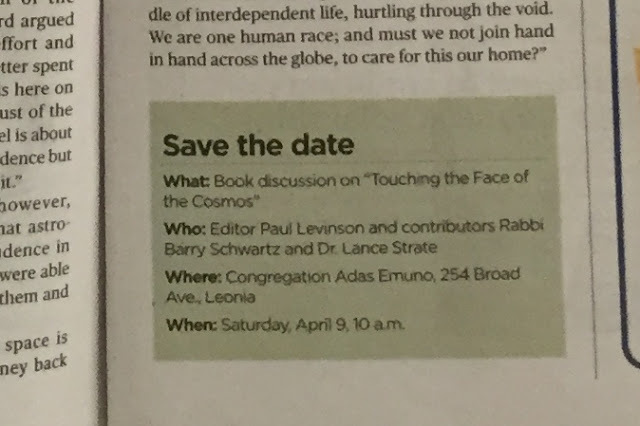 Barry Schwartz dreamed of being an astronaut as a child, but when he grew up he landed not on Luna but in Leonia, where he is rabbi of Congregation Adas Emuno. 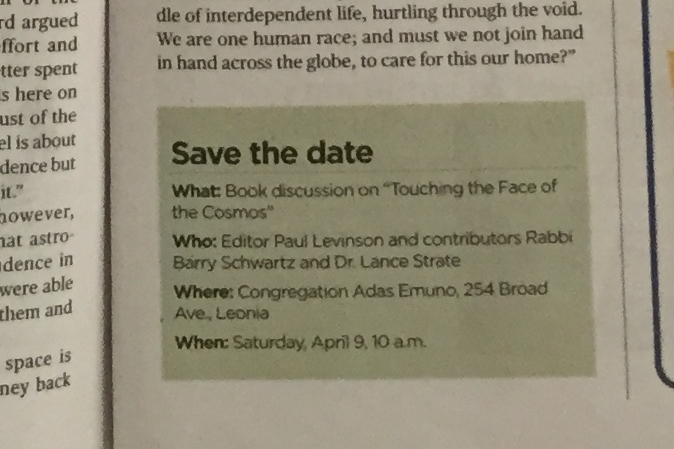 This month, with the publication of Touching the Face of the Cosmos: On the Intersection of Space Travel and Religion, a new anthology from Fordham University Press, Rabbi Schwartz finally finds himself bound up with astronauts both real and fictional, if only in the pages of a book. The volume begins with an interview with astronaut John Glenn, conducted by one of the editors, Dr. Paul Levinson. Dr. Levinson is a professor at Fordham University’s Department of Communications and Media Studies. He has published several science fiction novels and was president of the Science Fiction and Fantasy Writers of America, but it was a nonfiction work, 2003’s Real Space: The Fate of Physical Presence in the Digital Age, On and Off Planet, which was the springboard for this new anthology. This got him thinking about people’s expressed motivations for exploring space. There was the military motive that fueled the Cold War space race of the ’60s, the pull of scientific curiosity, and more recently, the view that there is money to be made in orbit. And thus was born “an anthology where people from different religious backgrounds and people who are not religious at all write about this intersection of space travel and spirituality,” he said. The book includes an essay from the Vatican’s astronomer, an anthropologist considering the symbolic meaning of objects taken to space by astronauts (including the Torah scroll taken by astronaut Jeffrey Hoffman), and scientist and science fiction writer David Brin giving an original midrashic reading of Genesis to justify scientific discovery and creativity. The book’s fiction includes a seder-in-space scene excerpted from one of Dr. Levinson’s novels and a story by Jack Dann, the editor of Wandering Stars, a 1974 anthology of Jewish science fiction, about a far-future rabbi on an alien planet. As for the actual rabbi in the book—Rabbi Schwartz entered the anthology via Dr. Lance Strate, Dr. Levinson’s colleague at Fordham who is president of Rabbi Schwartz’s shul. Dr. Strate—who is a Jewish Standard columnist—has an essay of his own in the volume, which mentions Maimonides but takes a somewhat more skeptical stance toward space exploration than the other contributors do. Rabbi Schwartz, however, argues in his essay that astronauts found transcendence in space—and that they were able to bring it home with them and share it with the world. “Our journey into space is really about our journey back home,” he writes in an essay that began as a High Holiday sermon in 1989, 20 years after the first moon landing. The essay looks at how the views from space changed our view of earth. When Rabbi Schwartz first delivered the sermon, he ended by holding up a photograph taken by the Apollo 17 astronauts that showed the blue globe of the earth. Yes, on Saturday, April 9th at 10 AM we will be hosting a special edition of our weekly Shabbat morning Torah study session, with Paul Levinson joining us to discuss his book, along with Rabbi Schwartz and Lance Strate (and there'll be bagels!). So please join us if you can, it'll be a discussion that's sure to be out of this world!